"I'm breakin' my teeth off. Tryin' to bite my lip." 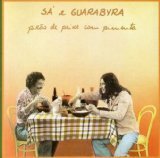 Pirão De Peixe Com Pimenta (this album) (1977). Sorry, no matches on eBay for "Trem De Pirapora Sa & Guarabyra".